Surface electromyography (EMG) measures the electrical activity produced by the muscles when they are activated by the nervous system. Until recently, there was no way to easily and reliably record EMG in a field setting or even just away from the laboratory or training room. Athos has changed this. Athos wearable technology for sports performance has embedded sEMG sensors that record sEMG signals that are as accurate and reliable as a research-grade system. We asked participants to visit the laboratory on seven separate occasions and perform isokinetic knee flexion and extension (kicking in and out) at 50, 75, and 100% MVC. We assessed reliability (how consistent the EMG signals were across days) and validity (how Athos’s signal compared with Biopac and how both systems were associated with torque). We found no significant difference between systems. Figure 1. Comparison of RMS EMG amplitude over time during a representative set at 60 deg/s. From top to bottom, vastus medialis (RVM), vastus lateralis (RVL), bicep femoris (RBF) and torque output. 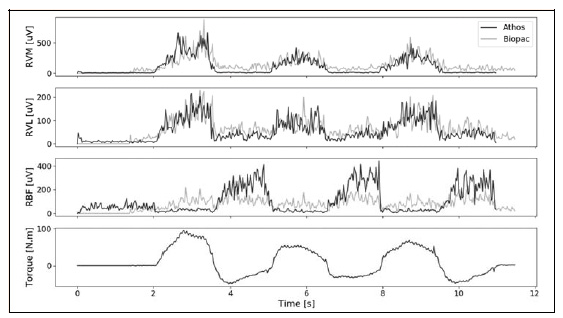 The information in the EMG signal can provide pivotal insights regarding muscle activity and recruitment patterns. Athos proved to be valid and as reliable as a research-grade system, while being portable and easy to use. Coaches and athletes can use Athos to record EMG signals to understand muscle coordination patterns and the internal load required to perform at practice, in the weight room, and during games. 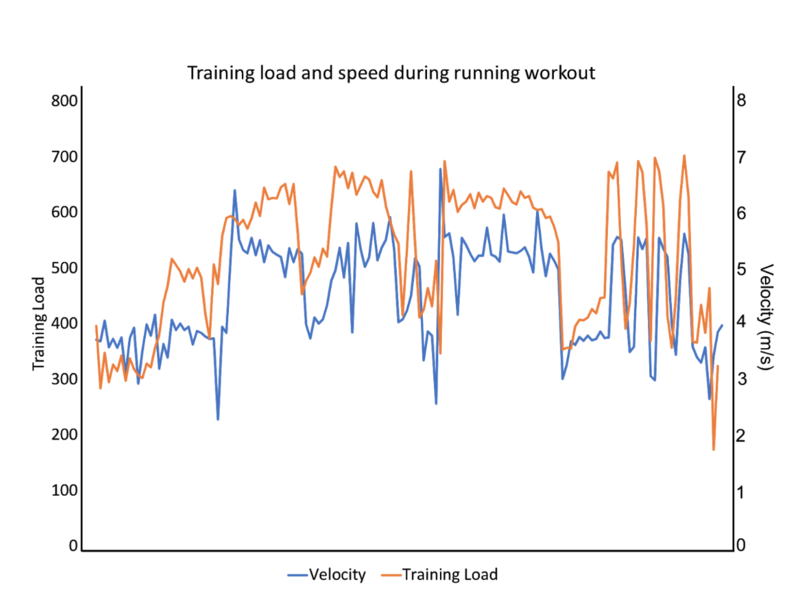 Coaches can use Athos EMG as a measure of internal load to periodize their team’s training schedule. By monitoring key muscle ratios such as gluteus maximus:hamstring and quadricep:hamstring ratios, Athos EMG garments can be used to be proactive about injury risk.